HTC will make the new One M9 official tomorrow morning, but that hasn’t stopped leaks from pouring in. Thanks to some sort of journalist who appears to have failed at meeting his embargo of an early hands-on with the device, we get to see the phone in comparison to the HTC One (M8) and One (M7). At this point, either HTC is pulling off the ultimate troll job in continuing to make us believe up to the last minute that they are just re-releasing the One (M8), only with a couple of tweaks, but will show off a super secretive design tomorrow, or they really are just re-releasing the One (M8) with a couple of tweaks. 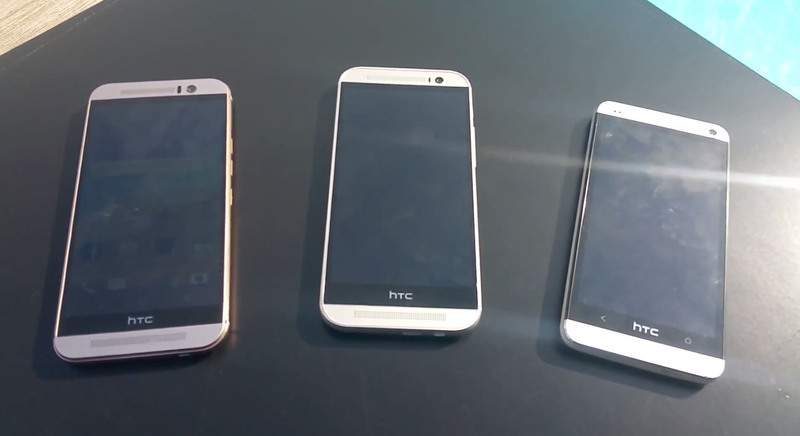 The new One M9 is pictured at the top on the left. In the video below, you can see it in hand, along with comments about the placement of buttons, the new camera on the back, UltraPixel camera on the front, and two-tone colorway. It looks nice, it just looks like 2014.